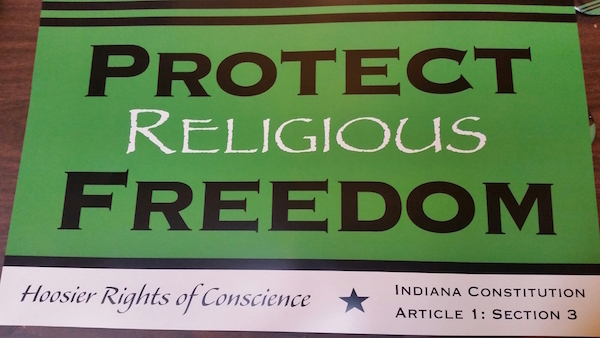 Yesterday Governor Mike Pence of Indiana signed into law the state’s Religious Freedom Restoration Act. The action has drawn sharp criticism by people and politicians who directly oppose religious freedoms and by those who are simply unaware of the Religious Freedom Restoration Act, the federal model for Indiana’s new law. Currently, 19 states have a Religious Freedom Restoration Act (AL, CT, FL, ID, IN, IL, KS, KY, LA, MO, MS, NM, OK, PA, RI, SC, TN, TX, and VA). Ten other states have religious liberty protections that state courts have interpreted to provide a similar (strict scrutiny) level of protection (AK, MA, ME, MI, MN, MT, NC, OH, WA, and WI). With some exceptions (such as Mississippi), the state versions are almost exactly the same as the federal version. Since many readers are unaware, it is worth noting that while the RFR does not protect businesses from discriminating against homosexuals, that is already allowed except in states or local municipalities that expressly forbid discrimination based on sexual orientation.